These counterfeit detector pens will reduce your risk of accepting counterfeit bills. But let's be honest here: this is not a fool proof method for identifying counterfeit bills (and we are the only ones who will tell you that). At best this is a first defense against counterfeit bills that are made on paper containing starch sizing (like common household copy paper). The truth is, there is no such thing as a magic counterfeit bill detecting pen! It just doesn't exist. Even so, millions and millions of these pens are sold each year, usually represented by the sellers as doing something quite magical. Actually, all that really happens with these pens is that a weak iodine solution in the ink reacts with the starch sizing in paper (starch sizing is the glue commonly used to hold paper fibers together). Real bills don't have starch sizing in them as they are linen based - but for that matter news paper and coffee filters don't have starch sizing in them either (so you can see the problems here). In theory, a dark brown or black mark left on the paper by the pen indicates the pen is "suspect," because the iodine has reacted with the starch sizing. If there is no starch sizing in the paper, the pen ink will not react and an amber mark is left on the bill, and then supposedly, you are to conclude the bill is good. The problem is, any good counterfeit bill will probably be made on correct starch free paper. Yes, you can use these pens, and they do help catch some bills. At the the very least they require the employee to examine the bills he takes more closely and that's something. 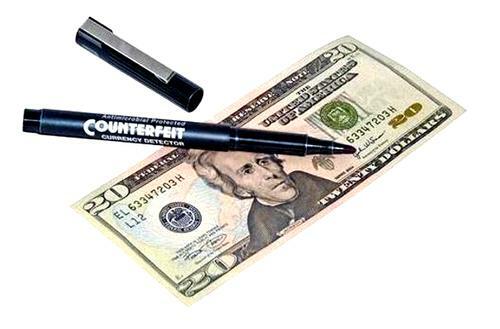 Counterfeit detector pens are a first defense against counterfeit bills. Not a great method for counterfeit detection, and we're the only ones who will tell you that!